Elo provides the driver in the support section of their website under the “Windows 7 Multitouch” section. Although the listed notes for the driver mention that an IntelliTouch monitor is required, we have done extensive testing and found it to be compatible with our AccuTouch-enabled (resistive) Elo touch screens. The driver provides significant enhancements to the Windows 7 experience and works well on both Windows 7 32-bit and 64-bit operating systems via both serial and USB connections. Once you install the drivers you will have access to the Pen and Touch features of Windows. While the primary functionality of Elo’s configuration is accessed via the “EloConfig” icon on your desktop, the best features are accessed via the Windows 7 Control Panel component “Pen and Touch” or the Flicks icon in your system tray. 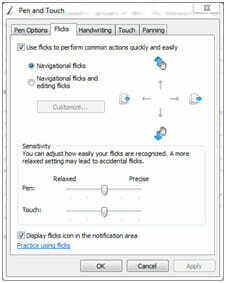 The biggest advantage the multitouch driver provides is Microsoft “flicks.” Flicks could also be described as gestures. For example, when you touch the screen on a web page and drag your finger up, it would be as though you were pulling the page upward to reveal more of the web page, similar to how you might gesture on a smartphone or tablet device. A great application of this feature might be navigating through web or PDF-based assembly procedures which we find many of our displays are used for. Microsoft even implements a physics response, scrolling with momentum when you quickly flick the page upward and slowly drawing to a stop. You can customize the flicks so they work in 8 directions: up, down, left, right and the diagonals in-between. By default, they will drag up, drag down, go back and go forward, but you can customize them to any number of preconfigured actions, or customize a key or key-combination for your specific application. A Touch Pointer feature makes it easier to touch specific objects or certain parts of the screen that are sometimes difficult to reach. When this feature is enabled, an on-screen mouse appears that you can drag to finely adjust the placement of your cursor. And simply press one of the virtual buttons and the mouse will click precisely where needed. This is an excellent application for when you’re wearing gloves and need to click on a small object or hard-to-reach area near the edge of the screen. Who Can’t Use This Driver? Unfortunately, we did find in our testing that the gesture-supporting driver is not yet compatible with USB-to-Serial adapters; instead, we recommend the Elo TouchSystems driver version 4.8.7b found on our downloads page. The gesture-supporting driver may also not be for you if you need the features from the standard driver, which allow you to hold a touch for long periods of time such as running a motor manually using an HMI controls application. All around, we found the usage of this driver to be solid, reliable, and feature-filled. The flicks capabilities really enhanced the Windows 7 experience and the touch pointer feature solves the age old problem of clicking items too close to the edge of the screen. We know you will enjoy this fresh perspective on the usage of a resistive touch screen, so if you have any questions or issues please contact our support staff.